There is just something about the end of the world that brings out nut jobs and wingnuts. I mean, loons thrive on this stuff and they always want to run to the book of Revelation to prove stuff. The problem is, the book of Revelation proves nothing except that there will be an end and when it happens it will be one big ouch after another. The problem with the wingnuts (yeah, I’m talking to you Harold Camping) is that they actually miss the meat and potatoes of the message in Revelations. Th rest of our Advent readings take us through the firs six chapters of Revelation and these are some of the most powerful discipleship passages in the whole Bible but you have to have ears to hear what the Spirit says. Please see the introduction to this year’s Advent on Week One’s post (click here) for more detail on translation theory and Advent motifs. I will not burden you by repeating all of that here, but I will remind you that I have included my personal notes in italics. I will post the third week’s readings next week. 1. A revelation of Jesus Christ that God gave to show his servants what is soon to come. He made it known by sending his angel to his servant John. 2. who bears witness to the word of God and is a witness of so much from when he saw Jesus Christ. 3. Blessed are those reading and having the words of this prophecy and who keeps this document, for the end is near. 5. and from Jesus Christ, the faithful witness, the firstborn of the dead, the ruler of the kings of the earth, the one loving us and who freed us from our sins by his blood. 6. He made us a kingdom of priests for God his Father—to him be glory and might forever. Amen. 8. Behold, he comes with the clouds and every eye will see whom they pierced, and they will mourn for him in every tribe of the earth. Absolutely, amen. Alpha and omega are the first and last letters of the Greek Alphabet. I almost translated this as simply “I am the A and the Z” but decided 2000 years of Christian tradition have solidified this as good theological language, as long as you know there is nothing spooky or special about omega and alpha. 9. I am John, your brother in Jesus and patient partner enduring persecution for the kingdom. I was on an island named Patmos because of the word of God and the teaching about Jesus. 10. I became in the Spirit on the Lord’s day. I heard a great sound behind me. It sounded like a trumpet. 12. Then I turned around to see the voice which was speaking with me and when I turned I saw seven golden lampstands. 13. In the midst of the lampstands was someone like a son of man. He was clothed all the way to the feet and wore a gold belt around his chest. 14. Now, his head and his hair were white as wool, white as snow, and his eyes were as a flame of fire. 15. His feet were like refined bronze from a furnace and his voice was as the sound of many waters. 16. In his right hand he held seven stars. A sharp two-edged sword was coming out of his mouth and his face shines as the sun in its full power. The phrase, “in spirit” appears quite a bit in Revelation. I honestly do not know if John means that he was in the Holy Spirit or if he means he was involved in a spiritual practice such as meditation or worship. I tend to think it is about worship because it was on the Lord’s Day, i. e. Sunday and not Hebrew Sabbath. Note also verse 16 and the present tense “shines.” That is intentional and reflects the GNT’s usage. 17. When I saw him, I fell at his feet as a dead man, but he put his right hand on me and said, “Do not fear. I myself am the first and the last. 18. The living one. I was dead and behold, I am alive forever; I have the keys to death and Hades. 19. Therefore, write the things you saw, and the things you now see and what you will see that is about to come after all these things. 20. The mystery of the seven stars that you saw in my right hand and the seven golden lampstands is this: The seven stars are the pastors of the churches and the seven lampstands are the seven churches. Jesus tells John that the seven stars are the seven “angels” of the churches. Now, angel is a funny word because it means messenger and can refer to human beings as much as to the spiritual beings we commonly think of as angels. My take on the usage here—and this is strictly interpretative and other good thinking people might disagree—but my take is that these letters are for the human messengers in these churches who serve as the leader, whom we would call today the pastor as well as for the church as a congregation—hence the seven stars (7 pastors) and the seven lampstands (7 congregations). 1. “To the pastor (angel) of the church in Ephesus write these things,” says the one holding the seen stars in his right hand and who walks in the midst of the seven golden lampstands. 2. “I know your works, your labor, and that you do not tolerate evil. You tested those calling themselves apostles but are not and you found them false. 3. You have patience. You bear my name and do not become weary. 4. But I have it against you that left your first love. 5. Therefore remember how you felt and repent—do the works you did at the first—if not, unless you repent, I will come to you and I will remove your lampstand from its place. 6. But you do have this, you hate the works of the Nicolaitans just as much as I do. 7. Those with ears, hear what the Spirit says to the churches. To the one who conquers I will allow him to eat from the tree of life that is in God’s paradise. The Ephesian church was guilty of losing focus on Christ and his mission and the threat– to remove their lampstand is a threat to remove their right to be called a church. No church has a right to exist ontologically and without proper leadership and a continual repentance, the Lord may revoke it and remove himself from their midst. Think about the next time you see a church in decline or that has closed up completely. 8. “To the pastor of the church in Smyrna, write these things,” says the first and the last, who was dead and lived. 9. “I know your persecution and poverty (but you are rich), and the blasphemy of those who call themselves Jews but are really a synagogue of Satan. 10. Fear nothing that you are about to suffer, for behold, the devil is about to throw some of you into prison. You might be tortured and you will be persecuted ten days. Be faithful to the death and I will give you the crown of life. 11. The one having ears, let him hear what the Spirit says to the churches: The one conquering will not even be hurt by the second death. 12. To the angel o the church in Pergamum write these things,” says the one having the sharp two-edged sword. 13. “I know where you live—at the throne of Satan and how you hold firmly to my name and you did not deny faith in me, even in the days of Antipas my faithful witness who was killed among you—right there where Satan lives. 14. But I have a small thing against you. You have some who hold to the teaching of Balaam, who taught Balak how to be a stumbling block before the children of Israel, to eat idolatrous food and to fornicate. 15. Likewise, you have some holding to the teaching of the Nicolaitans. 16. Therefore, repent. For if you do not I will come quickly and attack them with the sword of my mouth. 17. Those with ears, hear what the Spirit says to the churches: I will give those who overcome hidden manna and I will give him a white stone upon which a new name has been written that is known only to the one receiving it. These two churches, Smyrna and Pergamum have issues of outside influence. Smyrna is surrounded by a Jewish community that tries to exert influence over the Christ-followers there. We have to keep in mind that mind early Christians were Jewish and there would have been a natural affinity. In Pergamum it seems the problem was false religious practices influenced by paganism. 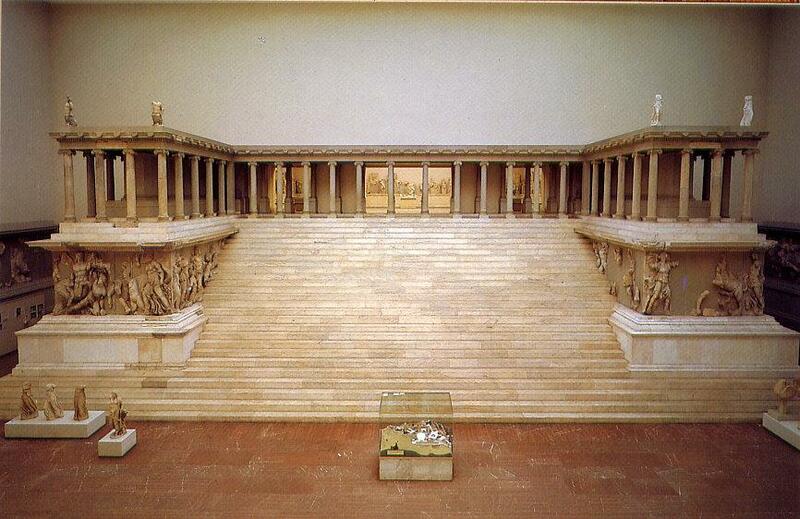 The throne of Satan refers to a famous altar with the statue of Zeus that now is housed in a German Museum. 18. To the pastor of the church in Thyatira write these things,” says the Son of God, the one having the eyes of flaming fire and whose feet are like polished bronze. 19. “I know your works—the love, faith, service, patience—your recent works are greater than the first. 20. But I have it against you, you tolerate that woman Jezebel, who calls herself prophet and teacher. She lures away my servants to fornicate and eat food offered to idols. 21. I gave her time, so she might repent, but she did not want to repent from her fornication. 22. Behold, I am throwing her into a bed of great affliction with those committing adultery with her so that they might repent from her works. 23. I will kill her children in death, and all the churches will know that I am myself am searching the gut and the heart. I will give to each of you according to your works. 24. Now, I say to those of you remaining in Thyatira, those who did not hold to this teaching, who did not know about the deep things of Satan, to you I say that I will not put another burden on you. 25. Except the one you have, hold onto it until which time I might come. 28. just as I received from my father, I will him the morning star. “Jezebel” and “Balaam” are names from the Hebrew Bible which are likely nicknames for real people. Balaam refers to a theological system that tolerates idolatry and fornication while Jezebel refers to a female leader, maybe the pastor of Thyatira, who has taught the wrong kinds of things.In verse 22 a “bed of great affliction” is a sickbed or a deathbed. At any rate, Jesus promises to make her and her lovers so sick that they are put to bed. The irony is that the place of her pleasure becomes the place of her pain. Of course it is not punishment for punishments sake, but instead punishment with the goal of repentance. The burden of verses 24-25 are not more afflictions but instead more commandments. Jesus will not ask anything else of them because they have already endured so much. 1. To the pastor of the church in Sardis write these things,” says the one having the seven spirits of God and the seven stars. “I know your works. You have a reputation for being alive, but you are dead. 2. Wake up! Strengthen what is left, what is about to die for I did not find your works complete before my God. 3. Remember, therefore, how you received, heard, kept, and repented. If you do not then wake up. I will come as a thief, and you will not know what hour I will come upon you. 4. But you have a few people in Sardis who have not defiled their clothing, and who will walk with me in white, just as I am. 6. Those with ears, hear what the Spirit says to the churches. The death that Sardis has seems to be related to their inability to finish what they start. They lack follow-through in their spiritual lives but maybe also in something tangible. Jesus doesn’t like quitters.